I did the Polar Plunge back in February. My blog post about it is here. 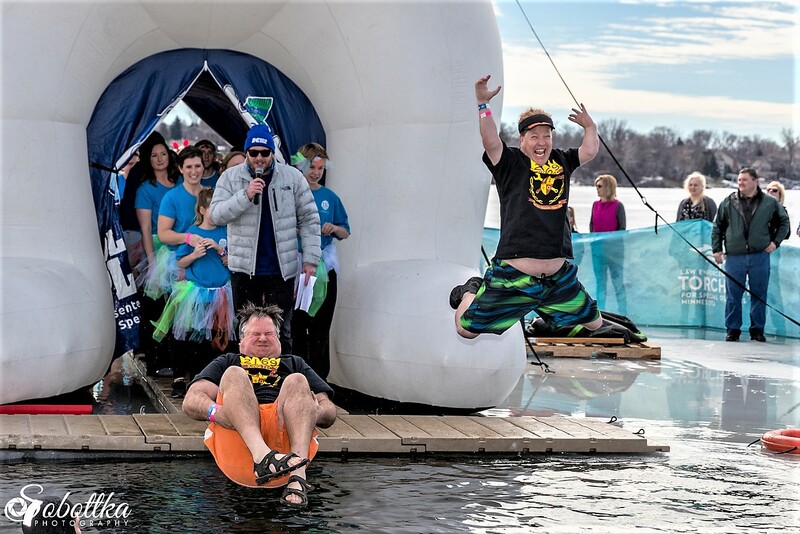 I just discovered this picture on the Minnesota Polar Plunge website and liked it so much I just had to share. Tuesday night, we went to the Minnesota Valley Electric Coop's annual meeting. Avery won a college scholarship from them and was asked to attend the event to accept his award. That was awful nice of them. On Thursday night, I competed in the Toastmaster's Divisional competition in downtown Minneapolis and won third place out of 6 contestants. I don't get to advance to the next round, but had a great time participating! On Friday night we went to the Meadows bar in Prior Lake and connected with our old friends, Kirk and Debbie Sumner. They're such nice people. This weekend brought us to the University of Minnesota's Mariucci Arena to the FIRST Robotics Competition North Star Regional 2017. We were there to support our favorite FRC robotics team, KING TeC #2169. We have a large team out of Prior Lake High School and they all come to support the team with their capes and crowns ready for action. All the parents wear their "I'm with Royalty" KING TeC t-shirts as we support our kids in the competition. It's always a lot of fun hanging out with these good people. I guess it's a good thing we all get along so well since we spend about 10-12 hours sitting next to each other during these two day tournaments. It probably wouldn't be nearly as much fun if we spent the whole time bickering with one another. The kids do a great job working together to have a competitive robot and mentor other students and teams to be successful as well. The boys have had some great coaches and mentors over the years. It was great to see our old buddy, Joel Volm, at the event. He was the boys coach for several years and also one of their high school science teachers. He's been a very good friend to Luke and Avery over the years. Minnesota Senator Amy Klobuchar stopped by for a few minutes to show her support for FIRST robotics and the kids who were there developing their STEM skills. The robot performed very well over the 12 matches in which it had the opportunity to compete. They are able to make it consistently hang during the end game and have one of the fastest gear hanging robots in the competition. This tournament the team put a lot of focus in getting their robot to be able to score points during autonomous mode and had some pretty good success. Avery is the head of programming and works closely with the mechanical and drive teams to make sure they are all syncing to have the best chance for competing. There's always a lot of intense debate on what tweaks to make to the robot between matches. It's a lot of fun watching the kids negotiating and making their cases for what they should do. The team had two close attempts at pulling off the challenging "Two Gear Autonomous" feat. This maneuver is particularly challenging because each robot can only control only 1 gear at the start of the match. So the way they attempt to do this is to have an alliance partner drop one of their gears in autonomous, then they add their first gear, and then go back and pick up the second gear that has been dropped on the floor. These were the two closest attempts. Cole and Katie have been part of the team responsible for the "Chairman's Award" presentations. They did such a good job in Peoria that they helped the team to win the Chairman's Award which allows the team to advance to the World Championships. Because of this, the team wasn't eligible to compete in this tournament's Chairman's Award competition. But the team did win the Entrepreneur's Award in Minneapolis. So they got that going for them. Which is nice. Bill Jenkins has been an incredible mentor for the team. He has a career in programming, so he and Avery have been spending a lot of time together the past few months. Avery has learned a ton from him! In only a few short months, Luke and Jackson will be college roommates at Minnesota State Mankato. I just can't believe the time is flying by so fast! When I asked Jackson if he was excited to be living with Luke, he had an interesting reaction. I hope this means he's excited about it. We went to lunch at Stub & Herbs which gave us a good taste of college life. I want to go back to college! What an incredible team containing so many talented students with such bright futures. It has been wonderful spending time with all of them. I'm really going to miss it when my kids graduate. I've always taught my boys to swim against the stream and I guess that's what Luke was thinking here.